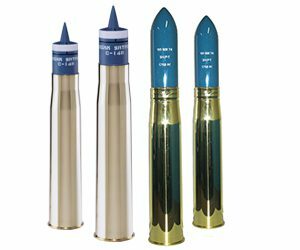 General Dynamics Ordnance and Tactical Systems – Canada (GD-OTS Canada) now offers one of the most advanced Mobile Gun System (MGS) training cartridges on the market today: the NATO qualified SRTPDS-T C148 and the SH/P-T C109A1. The C148 has a safety range of 8 km, making it one of the most effective tank training rounds of its kind. Both rounds can be fired from either a L7 or M68 tank cannon and is currently in service with the Canadian Armed Forces. The 105 mm Short-Range Target-Practice Discarding-Sabot (SRTPDS-T) C148 cartridge is a NATO-qualified, low-cost training round. It can be fired from the L7 and M68 tank cannons and is currently in service with the Canadian Army. Ballistic Match with Operational APFSDS Projectile: to 2,500 m.
Maximum Safety Range: 8,000 m.
The 105 mm Squash Head Practice Tracer (SH/PRAC-T) C109A1 cartridge is NATO-qualified and in-service with the Canadian Army. It does not use a spotting charge to prevent damage to pop-up targets. It can be fired from the L7 and M68 tank guns. Ballistic Match with HESH L35A1. Projectile: to 4,000 m.